Reliance Chairman Mukesh Ambani declared digital freedom all feature phone users, because enable digital life all need access to data at affordable price range. Here you can compare the price and select the best option for you. Here is the comparison of the tariff plans offered by the top five telecom operators – Reliance Jio, Airtel, Vodafone, BSNL and Idea Cellular. The feature phone users was to consumed of data on any other operator network they spend over high price par month at the prevailing 2G data range and Jio will provide this only at the 153 rupees per month. Under this offer, users will get 512 MB data per day after the FUP ends. There are more options like a weekly package of rupees 54 and two-day plan for rupees 24 as same features, that starting on 15th August in the year. 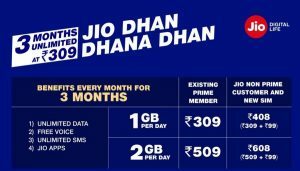 Jio old Data pack Dhan Dhana Dhan rupees 309 offers high speed data benefits of 1GB per day and jiophone TV cable available in this pack. Airtel and Idea are providing there old recharge pack that provides users with unlimited call (300 per day and 1,200 per week) and 28GB of high-speed data for 28 days.